My man did it. He has advanced to the top 5 in The River's Artist Showcase. As Melissa said, "He's in the show!" That's baseball terminology, in case you don't know. If you are looking for a reason to get out of the house, come to Austin, or just plain want to have the best night of your life . . . here is your opportunity. 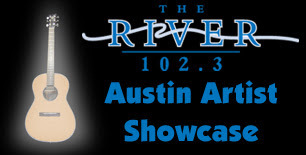 102.3 The River is excited to annouce the 2nd River Austin Artist Showcase coming next Friday @ Riverbend Church! The River Austin Artist Showcase is free, so bring your friends and family to come see some great musicians on stage at Riverbend with 102.3 The River.